Museums Static Displays And Talks | The Vikings! Our members are constantly engaged in research of the periods we cover and often either side too so that they understand the development and history of the items they use. They wear as near to fully authentic clothing as they can achieve. Similarly the weapons they fight with and their everyday items such as cooking utensils, eating equipment, and craft tools. Personal items such as knives, belts, pouches, combs and pins are normally replicas of archaeological finds. We are happy to work with museums and similar organisations to help put together static displays of replica artefacts, to participate in museum days with craft demonstrations and talks, or to find speakers willing to talk to groups with an interest in the period. As one might expect we are very familiar with creating interactive experiences and are happy to attend your venue to engage with your customers. 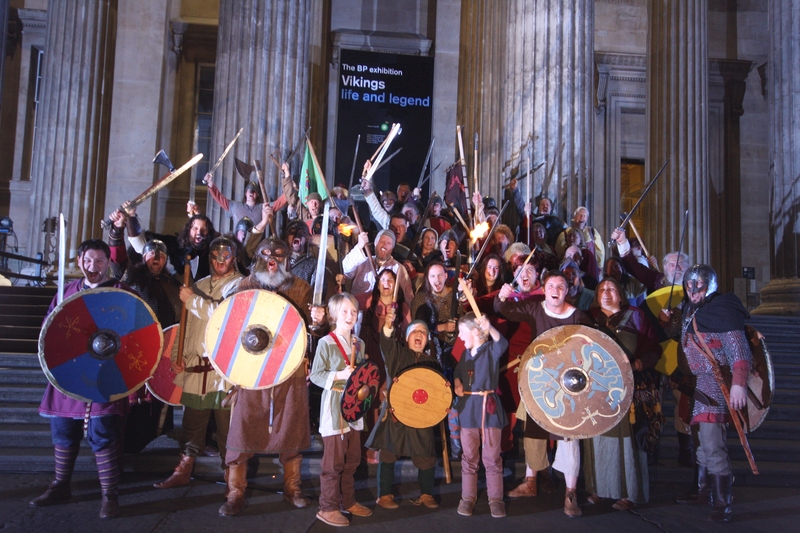 The Vikings have attended prestigious launch events too - including the British Museum, Glasgow Museum, The Royal Armories, and others. Please contact us with your requirements and we will start to plan your display or talk with you.